For a morning as anticipated as Easter, only a gift that's equally as exciting will do! That's why we've created this fun, beautiful tower. We've brought together four specially designed festive boxes and filled them with a bounty of decadent treats, including rich gourmet chocolates, sweet classic candies, and crisp handcrafted popcorn, resulting in a gift that will make this Easter unlike any other. 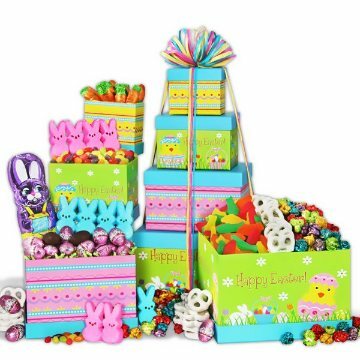 This gift includes the following: Carrot Bundle Bag, Gummy Fish - 8 oz., Caramel Bunny Bites, (2) Peeps - Assorted Colors, Yogurt Covered Mini Pretzels - 6 oz., Double Crisp Chocolate Bunny, Jelly Beans by Buttercup Candy Shoppe - 3.5 oz., Confetti Popcorn.